A new ship, only completed last summer, has been in King George V Dock for the past few days. 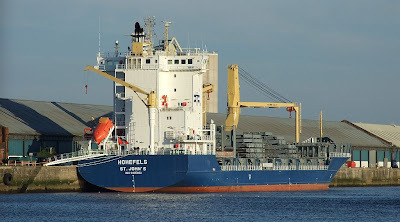 HOHEFELS was built in China by the Yangfan Ship Group, and she is 139.2 metres overall. Capable of carrying up to 957 TEU, she has a deadweight of 11,500 tonnes. Her last port was Hamburg, and she is due to sail tonight for Leixoes in Portugal. She is operated by Rass Schiffahrt GmbH.